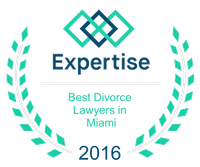 Divorce for Pro-Athlete | Miami Family Law Lawyers Vilar Law, P.A. The statistics are well known: half of all first marriages end in divorce, and two-thirds of second marriages also end in divorce. While divorce, in and of itself, is difficult and costly (some estimates set the average divorce at about $20,000), matters are further inflamed when also including the complications of fame and fortune. Pro-Athletes inhabit a special corner of wealthy Americans. Unlike CEOs of companies, or people born into money, Pro-Athletes tend to come from financial circumstances where the thought of earning enormous amounts of money was never a reality. And that lack of knowledge can become a huge liability when that person becomes very handsomely rewarded through their athletic success. In many cases, Pro-Athletes married before they made their fortunes. They may have met their spouse while in college or even married their High School Sweetheart. Because that person stuck around through the hardest of times, there's a mentality of "rewarding the one that was there all along," which in some ways is romantic and admirable. Unfortunately, this often leaves a Pro-Athlete's finances unprotected. Since the reality of living with millions of dollars can be unreal, the reality of a Pro-Athlete's Divorce Settlement often seem like something out of fiction. Take the case of Michael Strahan, the former New York Giants defensive lineman. When his second wife and he divorced, she received an eye opening $15 million settlement, with $18,000 per month child support payments. While this decision was determined fair and equitable in New York State Family Court, that doesn't necessarily mean that it represents the best interests of the Pro-Athlete themselves. In a New York Post article about Pro-Athletes and their troubled finances, former NBA player Adonal Foyle, who wrote a book about Pro-Athletes' unhealthy finances, quoted an (unverified) statistic that NBA players have an 87% divorce rate. Per Time Magazine, even the most famous athletes are subject to hefty settlements due to their divorces. For example, Michael Jordan's settlement with his ex-wife was $168 million, and Tiger Woods' settlement with his ex-wife was $100 million! These incredible amounts of money could have been easily curtailed if only athletes had the foresight to seek proper legal advice before signing their marriage papers. Of course, some athletes believe that such a line of thought is wishful thinking, and even ungrateful from the spouse's perspective, because before an athlete has "made it," they're acting protective over something they don't have (and may never have). Of course, this is a mistake. Not only are the rates of divorce incredibly high for Pro-Athletes, meaning that thinking of future earnings is necessary, but many studies cite that 60 percent of athletes end up broke 5 years after they retire. Or, as some like to put it, the majority of a professional athlete's wealth is made with more than half their lives ahead of them. It is reasons like these that make it vital for a Pro-Athlete, whether they're the starting quarterback of a professional football team, a career benchwarmer, or a college prospect, to find proper legal representation in the case of divorce. Vilar Law has been practicing family law for the last 20 years, and has handled its share of clients both with low assets, or high assets like a Pro-Athlete. If you're a Pro-Athlete and need legal representation regarding marriage, alimony, child support, or prenuptial agreements, contact the Vilar Law Offices at (305) 373-8000, to schedule a consultation.